– Chemicals added to fabrics to enhance durability and stain and wrinkle resistance have been linked to both reproductive and developmental toxicity, as well as cancers of the liver and bladder. But organic cotton contains none of these. – Aluminum can induce oxidative damage, which has been linked to Parkinson’s and amyotrophic lateral sclerosis (ALS), yet a typical dose of your regular antacids can contain as much as 400 mg of aluminum. A little soda water anyone? – Your cooking pans coated with non-stick Teflon can release six toxic gases when heated up to 680Â°F on a regular electric stove, including two carcinogens, two global pollutants, and a chemical known to be lethal to humans. Maybe the extra scrubbing of a regular pan is worth it. – The air in your home is constantly filled with toxins from the paint on your walls, the glue that holds down your carpet, and the fire-retardant chemicals coating your comfy mattress. You can learn how to minimize your exposure. With the help of The Healthy Home, you’ll learn about the dangerous substances you may be exposed to on a daily basis, and the simple but effective changes you can start making today that will help you and your family reduce your toxic burden. While I did enjoy the book, my only issue with it came from some rather silly scare tactics about CFL light bulbs. Sure, there is mercury in them; we all know that by now. But the truth is that compact fluorescent light bulbs use up to 75% less energy and last up to 10 times longer than incandescents, and if every home in America replaced just one incandescent bulb with a single CFL, in one year it would save enough energy to light more than 3 million homes. The Environmental Health Watch says that “the overall mercury exposure from coal-fired power plants is very substantially reduced by use of CFLs” so I am not as much concerned with breaking a bulb in my home as much as I am about reducing the demand for more coal-fired power plants required when people don’t reduce their energy dependence at home. For more information on CFLs and any potential hazards, check out my posts Are CFL light bulbs dangerous? and who is behind the fear mongering over CFL bulbs. Sounds like a nifty book. I am constantly looking for more information as good source material to spread the word on the dangers inherent in untested household products. Trust just isn’t warranted to any commercial product anymore, the more you know the better off you’ll be. I am actively changing over everything in my home to earth and living creature friendly products. The amount of chemicals that we are exposed to on a daily basis that are not in our control is truly frightening. Controlling what we can is the way to go. Thank you very much for all of the information that you provide! It is most appreciated. As I am entering the field of green interior design I am always looking for information about the reasons not do everything (or anything) the conventional way in our homes and every day habits. This books seems like it would be a great way to gain fresh ideas and valuable knowledge. I would love a copy of this because as an owner of a RV and a manufactured home, I know these places are crawling with unhealthy toxins. I’d love to reduce my exposure as much as possible! Thanks. I’ve heard from many that this book is wonderful! I would love a copy in order to learn more about improving the air quality in my home. Please enter me to win! This book sounds like a great resource. I’m always looking for ways to reduce my chemical exposure, and I think I just roped my sister into it too! She’d love this book for sure. I would love to read this book. I am always looking for more great resources on how to make my home as safe as I possibly can for my family. When our son was one, he was diagnosed with asthma. Although we gave him the necessary medicine, we’ve systematically gone through our home and have eliminated many toxins from our environment. Needless to say, the flare-ups have significantly decreased. We’d love this book because we know there’s more to do… Having seen what a big difference small changes can make, we’d like to clean up our act as best we can! 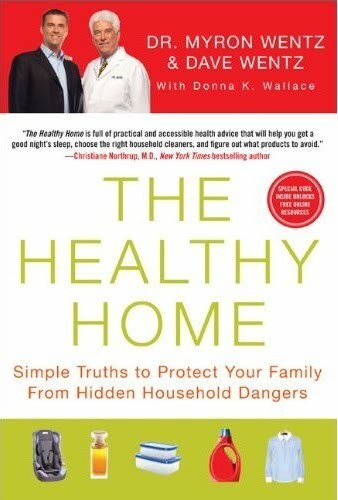 I would LOVE to win a copy of this book, because this is one of my major concerns – how can I make my home healthier for myself and my three children? Thanks for featureing this book…even if I don’t win, I will definitely pick up a copy! I’d love to use the info in this book as I strive to create the healthiest life I can for me and my family. Plus, I’m especially interested in how to make my home healthier as I prepare for the arrival of my first baby! I would truly love to own this book and can’t afford to buy it…really. But I constantly talk to and teach others about how to save the planet and have a healthier life. In addition, my daughter is the PTA president at my granddaughter’s elementary school where they are all about being environmentally conscious. I’ll be sure to let her read it too. Thanks. I would love a chance to win this. This book sounds like a great way for me to learn what to do around my own home. Sometimes, with all the information out there, I feel overwhelmed and don’t know where to start. This could be it! This would definitely be a great addition to the collection of items that I’ll be taking with me to college next year. I’ve already followed up with Kamal Meattle’s TED Talk on removing toxins from indoor air via house plants and would like to build on that to ensure an ideal living place for me and my roommate. I just moved, so making sure my new home is healthy would be great. I have Multiple Chemical Sensitivities (MCS), to a disabling level, and really need a copy of this. Thanks for entering everyone! Winners will be notified by email in the next day or so.